When it comes to renovating your kitchen, we’re betting that you are looking for beautiful results that are built to last. Investing a bunch of time and money into kitchen renovations can all be for naught if the cabinets and appliances begin falling to pieces. 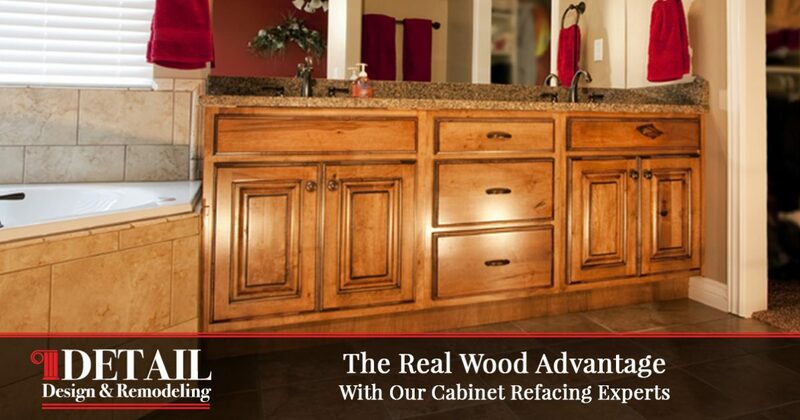 Cabinet refinishing is one service that can provide long-term results at an affordable price point. Detail Design & Remodeling is proud to offer the best cabinet refacing to Atlanta homes, creating stunning dynamics that are priced well with a better impact on the environment. Our home remodeling contractors aim to deliver the best outcome for your kitchen, taking the time and effort needed to create an amazing outcome that is built to last. Our cabinet resurfacing services aim to implement the highest standards of quality. While our focus on long-term results has helped to make us a top choice for cabinet refacing in Georgia, we understand the appeal that cheaper materials have for companies everywhere. Today, we’ll compare the benefits of utilizing real wood for cabinet resurfacing against the pros and cons of using a Medium Density Fiberboard (MDF). If you are wanting to learn more about our quality services, be sure to contact our cabinet contractors today! This modern cabinet option can prove to be beneficial for many people. For one, the materials needed consist of wood residuals that are broken down and mixed with wax and resin. The tactical creation of MDF helps to make it more affordable in comparison to wood cabinet options. The recycled components of MDF also provide a useful boost to the environment, as discarded materials can now be reused. The manufacturing process creates a finish similar to wood that also does not hold a distinguishable grain pattern. Anyone looking for a smooth finish that is easy to obtain will be happy with MDF. While the price of MDF is a major selling point, our cabinet contractors will be the first to tell you that saving in cash isn’t worth it. Many MDF products are constructed cheaply, resulting in materials that may expand or contract based on given conditions. Placing a cheap MDF panel next to the oven, for example, can lead to excess heat that causes the materials to contract and shrivel up. In lower quality materials, color changes have been known to occur for white kitchen finishes. The fastness of the color can result in a kitchen that is quite unsightly. The air quality of your kitchen is also important. One chemical that has been in major headlines over the past few years is formaldehyde and its carcinogenic effects. This material has been known to cause a wide range of neurological issues, ranging from nausea and confusion to cancer. Recent tests have illuminated how common formaldehyde is in the home, and MDF happens to be one of the biggest contributors. Any cutting you do with MDF requires adequate protection to keep you safe. While the dust is immediately hazardous, the long-term exposure to formaldehyde can also prove to be a problem. Further tests are needed to see how much off-gassing occurs with your MDF cabinets. On the other end of the spectrum, wood cabinet veneers and products feature a wide range of benefits. For one, the wood we use with our cabinet refinishing services is built to last, providing strength and durability for years to come. The natural beauty of this product also makes it highly demanding for creating dynamic, personalized products for the discerning homeowner. The styles and options for your wood are nearly endless, ranging from vibrant Maples to luxurious Cherries. Wood also retains more value, helping you at closing time if you decide to sell your property. While the grain pattern was a negative in the previous section, many homeowners focus on this feature to creating a living kitchen style that surrounds you in timeless beauty. 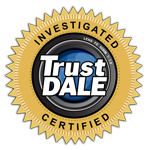 It’s important to know that the quality of wood cabinets come with a price tag. While we feel that real wood is a much better investment, the upfront costs do need to be considered before getting to work. 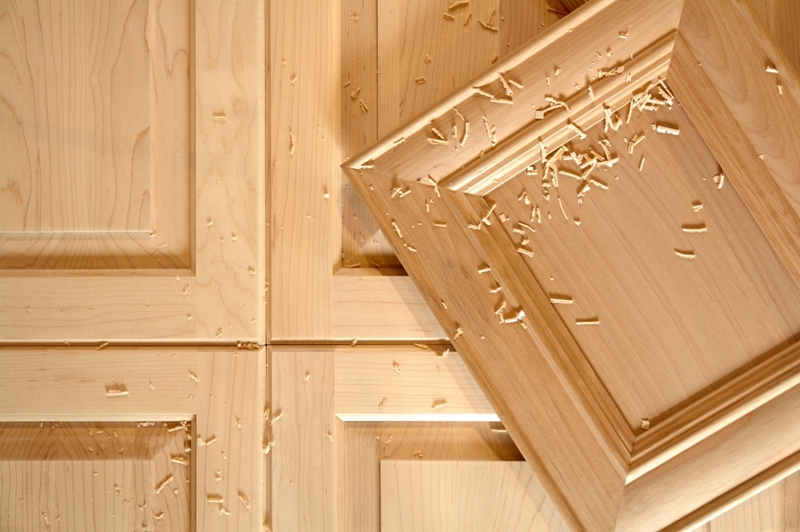 The maintenance of your wood doors is also a necessary part of the process. Measures need to be taken to protect your cabinets, ranging from sealants to sanding and more. Your real wood cabinetry may create a stunning visual display, but only if you take proper care of it. Homes that are not climate-controlled need to take extra protection measures, as wood tends to expand and contract if exposed to enough temperature or humidity changes. When it comes down to it, the choice of which material to utilize for cabinet resurfacing depends on the style and budget of the customer. As a top supplier of quality cabinet refacing to Atlanta residents, Detail Design & Remodeling only supplies real wood products for all of our work. Our passion for precise results and exceeded expectations have helped to make us a top choice for kitchen renovations in Georgia. If your cabinets are in need of updating, be sure to contact our home remodeling team today for a quote!